Raichatou collects water from a marsh during the rainy season. During the short rainy season, which lasts one to three months, households depend on marshes to meet their primary water needs (drinking, cooking, washing, livestock). This water is turbid and contaminated with weeds, human filth, and animal excrement. While this source of water is non potable, it provides plentiful quantities to support families. After the rainy season, the children dig in the marsh and bring this mud-water home to their family. After the rainy season ends, the people of the Azawak rely on water holes dug into the dried marshes, in surface sediment up to 20 meters deep. To access these underground rainwater reserves, men and boys spend hours a day digging into the sediments, essentially chasing the water deeper and deeper as each day goes by. A few liters of water are drawn from these holes throughout the day, and during one day water seekers will move from one hole to the next waiting for the water to pool back in the bottom of each hole. The quality of water lifted out is poor, often turbid and polluted. This man is at the bottom of a marsh well, digging in the mud to access more water. Once the marshes and the water holes dry up, both nomads and sedentary populations travel up to 50 kilometers round-trip in search of water for themselves and their animals at deep wells interspersed throughout the territory. Because water cannot be found at shallow depths, these wells range between 120 and 175 meters deep, thus explaining why these deep wells are so rare. Families can spend between 6 to 8 years hand digging before ever reaching water. The number of functional wells in the Azawak is limited to approximately one water source every 10 to 50 kilometers. The low number of water sources forces everyone – and their animals — within a 25 kilometer radius to share these rare and precious resources. Severe overexploitation causes the few existing wells to dry out prematurely. People may therefore spend as many as two or three days without water, waiting for a well to replenish itself. 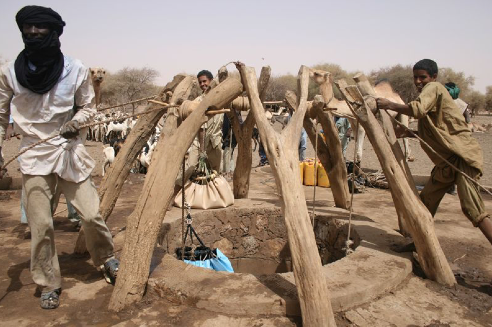 Open wells of this depth are not ideal: manually pulling water at a depth over 50 meters is labor intensive, time consuming (it takes approximately 10 minutes to retrieve 20 liters of water from a well 100 meters deep), and requires animal traction (up to four to seven donkeys) rarely available to the most vulnerable households. Deep open wells, 120 – 175 meters deep, require arduous manual and animal labor to extract water. Finally, even these open wells of this depth dry out and are thus not a year-round source of consistent or potable water. 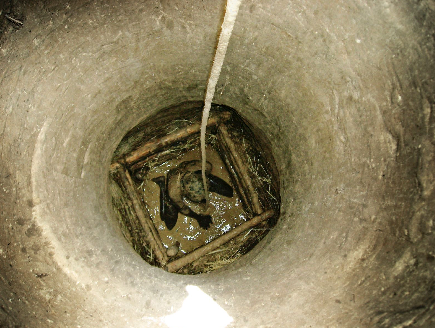 The water extracted from these wells is often no more than mud. During the nine to twelve month long dry season, most individuals survive on less than 6 liters of water/person/day — a quantity well under the World Health Organization prescribed minimum of 15 to 25 liters of water/person/day — and have difficulty finding time for other activities such as basic household chores, revenue-generating activities, and school. Nomads and sedentary populations travel up to 50 kilometers round-trip in search of water for themselves and their animals at deep wells interspersed throughout the territory. People may therefore spend as many as two or three days without water, waiting for a well to replenish itself.